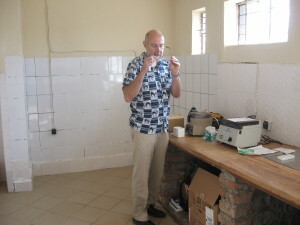 Project Congo, in partnership with Worldwide Labs installed a new laboratory at St. Vincent’s which will allow for diagnostic testing resulting in higher quality medical care for patients in Bukavu, DRC. The lab includes microscopes, centrifuges, refrigerator, and a variety of test equipment all set up to run on car batteries. This provides the doctors at St. Vincent’s the ability to perform blood and urine analysis both for their own patients, and as a service to other health facilities in the area (providing an income stream). Worldwide Labs is a nonprofit based in Michigan that purchases and accepts donations of used quality laboratory equipment. They completely refurbish the equipment and provide technicians to install it onsite and train doctors, nurses and lab techs. James Borody was the lab technician who installed the lab and provided training. Prior to joining WWLabs, James spent 11 years living in Niger. He speaks French fluently.